These annals are a compilation of events concerning the Shawnee Methodist Mission year by year. The information was culled from a variety of sources. Most entries include a citation to the source. Thomas Johnson established the mission in 1830 near Turner in present Wyandotte County, Kansas. He also founded the Indian Manual Labor School, which operated in conjunction with the mission. It was moved to the Johnson County area in 1839 and the school operated until 1862. The Santa Fe and Oregon trails passed near the Johnson County location so travelers frequently stopped at the mission. The site housed the executive offices of the first territorial governor and the first territorial legislature met there. In addition to the Methodist mission, the Baptist and Quaker churches also operated missions for the Shawnee. 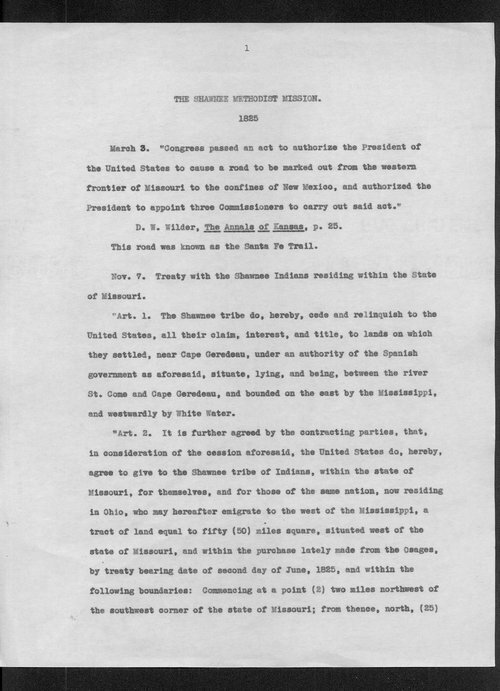 These annals are the complete manuscript from which a condensed version was published by the Kansas State Historical Society in 1939.